Fingerpicking Hybrid Acoustic Guitar...These performances are unaccompanied, complete-take, acoustic guitar solos. Greg plays them, alone. This is a blend of Travis Style, Classical, and some Flat-pick--played to perfection. 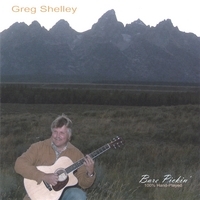 Artist Bio: Since about 1970, Greg Shelley has been performing, writing, recording and teaching music on guitar. His guitar work on stage and as a studio musician has been admired by many throughout the U.S. Despite many opportunities to leave for greener pastures, Greg has remained at home. He lives near the beautiful mountains, forests and coastlines of the Northwest, which are a source of inspiration. Working mostly alone, he continues to release quality original music for those who love guitar and guitar/vocals. Bare Pickin' is Greg's first solo instrumental release. It is a response to many who have requested it for decades--having heard his work on past projects. Other available CD albums include: "Is This The Way," and "Bumpy Road." Greg's Book, "Meditative Guitar," is a great way to begin reading music on guitar. These and other CD's are on this site. Greg's book is easily located through web searches. I have listened to all of his stuff in the past and this production is his most artistic work. Can anybody else get this much expression out of one guitar? Very nice and clean production. One man-one guitar. Awesome fingerpicking. Every time I hear it, I find it incredible that the music is just Greg and his guitar. Contemporary accoustic guitar playing at its finest! I have been playing 'at' guitar for 47 years. Greg Shelley IS guitar. I've been looking for this sound since the 80's. Every song on this album is great, but "America, Still Beautiful", "Yellowstone Summer", and "Bare Pickin'" knocked me out. Thanks Greg, you made my millenium!